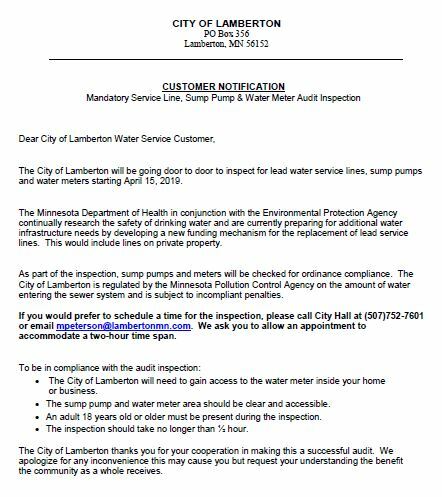 City of Lamberton....A Great Place to Live! In the City of Lamberton, we are defined less by boundaries on a map than by the sense of shared values our residents hold dear. Small town values, guided growth, preservation of historical, cultural, and natural heritage are just a few of the core principles that makes the City of Lamberton a wonderful place to call home. The Lamberton Lions Club Meeting, 7:00 p.m., at Revere Christian Fellowship Church (Main Street, Lamberton). City Council meetings are held in the City Office on the 2nd Monday of each month, in accordance with the schedule set at the beginning of the year. (4/3/2019) There is an open house for the Redwood County Highway Department on April 16th, 2019! You can find out more information on the open house by clicking on the link!